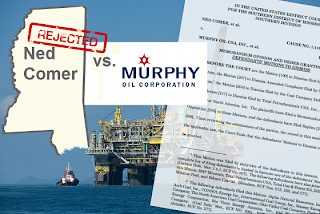 Comer vs. Murphy Oil court case rejected. In one of the oldest cases of climate change litigation, the plaintiffs were dismissed again. In the case, Ned Comer, et al. 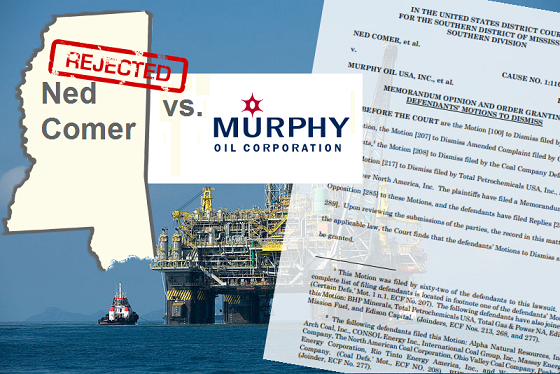 v. Murphy Oil USA, Inc., the judge referred to the doctrine of "res judicata". On substance, the judge reiterated that the plaintiffs have no standing and put causality in question. Though the plaintiffs were demanding compensation for damages in a climate change litigation trial, their claim required that the district court created and enforced emission standards upon the defendants and all other emitters. The defendants argued in the same way as the defendants in the Connecticut v. American Electric Power case, stating that this is beyond the scope of the judicial branch and that this is a legislative issue. The political questions doctrine is therefore an obstacle. The authors of the blog suppose that the judges at the superior (appeal) court will find it difficult to overrule this dismissal. See the original court decision here. I hope this trial gets to a complete arbitration as soon as possible. There are just so much at stake here. This case is complicated. The plaintiffs have to prove "scientifically" that Murphy Oil alone has caused Hurricane Katrina. Establishing facts would require years of studies and researches to compile.